This Haunted House Centerpiece is so fun to make, not to mention that it's made with simple craft materials! The spooky images you see in the windows and door are printed from your computer! Keep in mind this is not a super quick craft, you are actually making 3 small crafts at once. 1. Wrap your piece of cardboard with newspaper. This will be the base of your centerpiece. 2. Fill ⅔ of your brown bag with newspaper, fold over the top and tape to secure. 3. Cut out your windows and door from your printed template. Cut as many windows out as you'd like on your house, there are many to choose from! 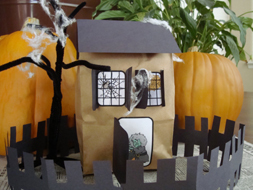 Before your glue them on your house, trace them onto a piece of black construction paper and add a ¼" to the width. These black shapes will be the door and shutters for your windows. Cut your black window shapes in half, make a ¼" fold and glue them to either side of your window. Do the same for the door. You can put windows on the front, side and back of your house! 4. To make the roof of your house cut a 5½" X 6½" piece of black construction paper, fold in half and glue to the top of your house. 1. Put 7 black pipe cleaners in a bundle. Cut off a small piece from your 8th pipe cleaner and wrap it, like a twist tie, around the bundle about 2" from the bottom. Wrap it around completely so that no ends are sticking out. 2. Spread out the pipe cleaners - this will be the bottom of your tree. 3. About 4" more up the bundle, take one pipe cleaner and wrap it around the bundle a couple of times. Stick it out like a branch. 4. Move another inch up the bundle. Take one pipe cleaner and wrap it around the bundle a couple of times, and stick it out like a branch. Continue moving up the bundle in this fashion until all the pipe cleaners and sticking out. Pull apart a cotton ball and string it along the branches as spider webs. 1. Fold a piece of black construction paper in thirds. Cut along the fold lines so you have 3 equals strips of paper. Fold each paper in half and in half again(length-ways). 3. Fold each paper in half and in half again(length-ways). 4. Cut rectangles out of the top and bottom of the paper, so it looks like a fence (see picture). Make sure you don't cut all of the fold out! 5. Unfold your paper and you will have a long fence like the one in the picture. Do this with all three strips of black paper. Tape or glue all of your fence pieces together and place around your Haunted house and tree! You can add some more cotton ball webs around your house to make it complete! There are other things you can do with your Haunted House... make black paper stepping stones up to the front door... cut out grave stones for the front yard... be creative!